We wondered what we could expect from the second iteration of the Galaxy Tab 10.1, both in specs and naming convention. To a certain degree, our fears were confirmed today, in an announcement just ahead of Mobile World Congress. Having christened the latest iteration of the 7" variant the Galaxy Tab 2 (7.0), we are now blessed with the Galaxy Tab 2 (10.1). While not the most elegant naming convention, we do appreciate the consistency. Aside from the name we got some press shots that reveal an obvious landscape bias with larger speakers flanking the 10.1" screen, though chassis width is unaffected. The Android 4.0 (Ice Cream Sandwich) powered Tab 2 (10.1) is a touch more than a milimeter thicker (9.7 mm) than its predecessor, which is a bit of a surprise given that the original 10.1 was designed to one-up the iPad 2 in thickness at just 8.6 mm. 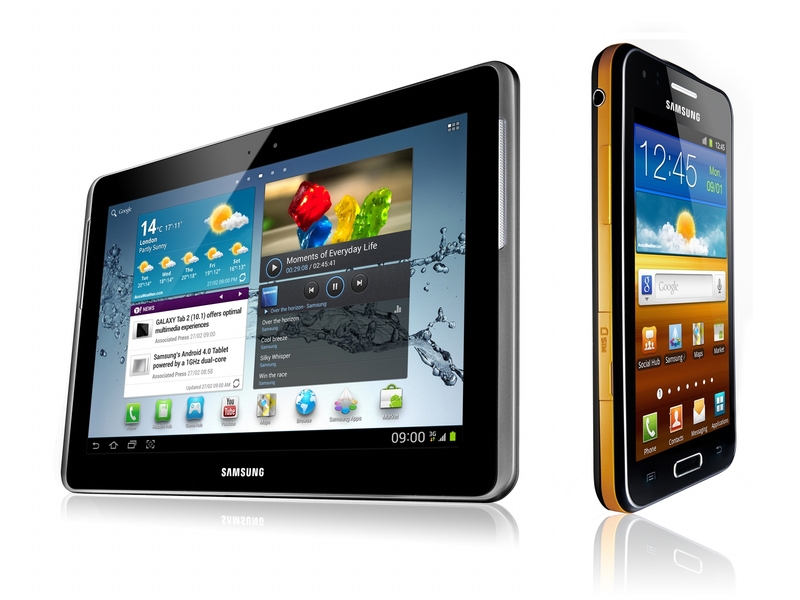 It is likely that the entire Galaxy Tab 2 will share the same, still unidentified, hardware platform; a 1.0 GHz dual-core SoC powers both the Tab 2 (7.0) and Tab 2 (10.1). These specs are quite similar to the Tegra 2 platform that powered the original Galaxy Tab 10.1, and the 10.1" screen is likely the same PLS panel from the original. Pair the relatively modest specs (in comparison to say the Asus Eee Pad Transformer Prime) and the rumors of a new 10.1" Galaxy Note with a ultra-high density display and a next-generation SoC, and it's likely that the Tab 2 line is being set-up as a lower priced, mainstream line. With component prices for the first generation of Android tablets coming down, we can expect this sort of stratification from all of the tablet OEMs in the next few months. If that's the case, then the Tab 2 line might not wow us with its performance, but it might make a compelling bargain purchase for those users that haven't tested the waters of the tablet market yet. Aside from the fleshed out Tab 2 line, Samsung also introduced a new phone to the Galaxy family, the Galaxy Beam. The specifications are pedestrian at best: 1.0 GHz dual-core SoC, 4.0" WVGA (800x480) TFT display, 5MP camera and running Android 2.3 (Gingerbread). What makes this a unique proposition is the microprojector contained within. Touted as providing a "high-definition" image at up to 50 inches, we were surprised to see that no detailed specifications on the projector unit were provided. Rumors that microprojectors would be the next big thing in phones have permeated the industry for a few years, this might finally be the year. We'll hopefully have some hands-on time with the device to flesh out some details. What we do know is that the phone is chunky at 12.5 mm, owing in large part to the projector, and that a substantial 7.4 Whr (2000 mAh) battery will keep your vacation slide shows rolling, untethered. MWC hasn't even started yet, so we'll have plenty more announcements to come. Stay tuned. i was able to gather some info,here and there, about the Beam.The projector is apparently a DLP by TI @ 15 lumens and 640 x 360 res,so trully crappy even by pico standards(ofc some sites are wrong at times so maybe things are a bit different).No clue about the light source but i think it's safe to assume it's LED. So the miniprojector demands a larger minimum thickness. If a phone utilizes all of that thickness throughout the length of the device, then we get a larger battery. how about make something useful on a phone like a camera that works WELL in low light? Or battery that lasts longer than a day? Something that actually might be useful. 100% agreed. I hope that future generations follow Motorola's lead with the Razr Maxx.